Summer is the season to enjoy stone fruit: peaches, plums, nectarines, and apricots are all kissed by the sun and bursting with juicy flavor—which is all well and good when you're eating them as is. But trying to cut up soft, ripened stone fruit for jams, baked goods, chutneys, or even as toppings for your morning oatmeal—well, that can get messy and wasteful. If you don't know what you're doing, you can end up bruising the fruit and turning it into a gloppy muddle. Fortunately, Meredith Kurtzman, pastry chef for Mario Batali, shows us just how to handle these delicate fruits so you can maximize their flavor and their beauty. Be sure to buy the best stone fruit you can and to wash them thoroughly. Remember, when you slice open fruits and vegetables, you're piercing their cells structure. Any dirt, pesticides, or bacteria on the surface then gets dragged through the fruit itself. Kurtzman starts with an apricot, which she deftly slices around the seam using a serrated knife. Why a serrated knife? Because contact with the hard pit of the fruit can dull the edge of your chef's or paring knife prematurely. 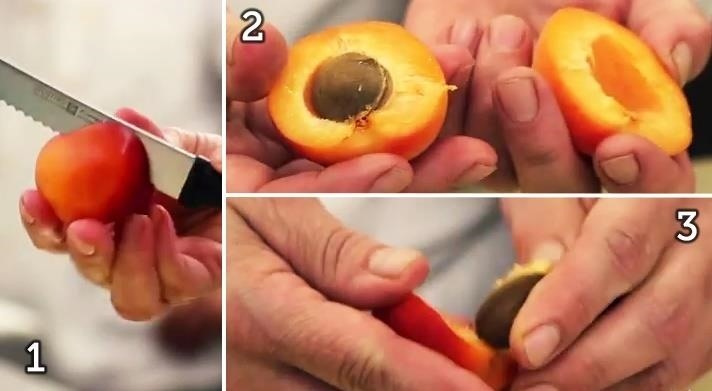 Then, twist the fruit open and gently pick the pit out of the fruit. Slice around the seam , twist open , and pick the pit out . But what about a very soft, ripe piece of fruit like a plum? That takes a little more finesse. 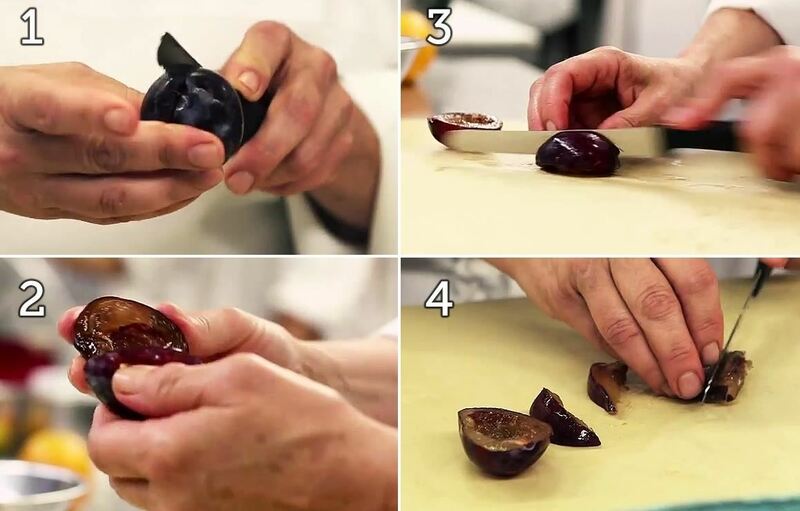 After you've sliced along the seam and twisted the fruit open, take the half of the plum with the pit and place it pit-side down. Gently slice lengthwise segments around the pit. 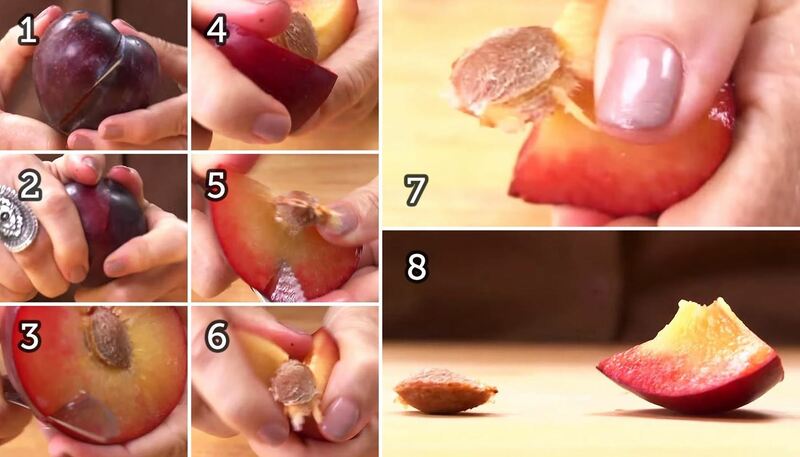 Then, slice the segments away from the pit so as to avoid bruising or ripping the plum's flesh. Repeat the process with the other half. Slice around the seam , twist open , slice lengthwise segments , and pull away from pit . Finally, Kurtzman shows you the trickiest fruit of all: a ripe nectarine. First, follow the same procedure as with the first two examples (cutting all the way around the fruit following the seam, then gently twisting it open). Then, take the half that still contains the pit and slice it lengthwise down the middle. Gently pry the two sections apart, and prop one segment on its small end so you can cut out the pit, leaving the fruit undamaged. Yay! Slice around , twist open , slice one segment in half , pull apart , and cut the pit out . In the end, you're left with a bowl of jewel-like fruit segments that you can continue to slice up so they can be used for baking, garnishing a salad, grilling, or topping a bowl of granola. Watch the video for more information. Another quick-pitting method comes to us courtesy of CHOW. 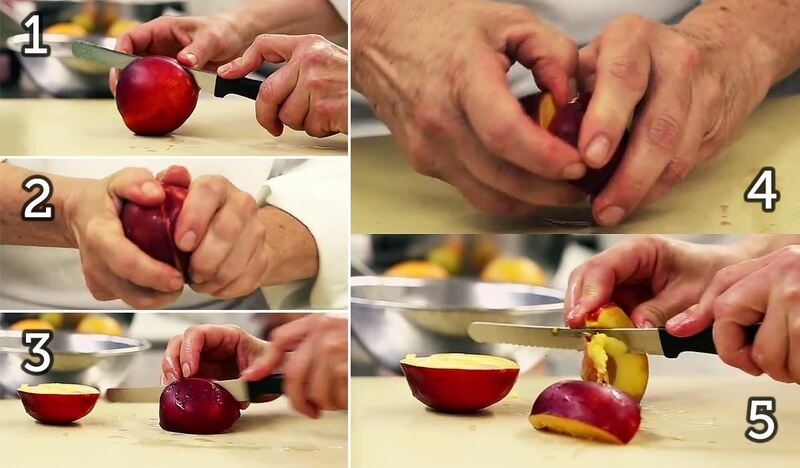 In this version, you slice the fruit along the seam and twist it apart. Next, you take the half with the pit and slice that down the middle, perpendicular to your original cut. Then you twist those two segments apart. The pit will still be embedded in one segment. Take that quarter-segment and make another slice around the fruit perpendicular to the precious cut. Twist those segments apart, and you can easily pluck out the pit with no harm to the fruit. Slice around , twist open , slice one segment in half , pull apart , slice the pit section again , twist apart one last time , grab the pit , and pull it out . Watch the video to learn more (and ignore that the demonstrator doesn't know what "circumference" and "diameter" mean—the tip is still good). I imagine that this tip could work well with other fruit that have large pits, like avocados. And now that you're a master at pitting stone fruits, you can move onto other things, like splitting apples in half with your hands and peeling them in mere seconds, peeling thin-skinned fruits more easily, removing stubborn pomegranate seeds, and keeping avocados fresher longer.